Having escaped three earlier brushes with death, Bideford merchant John Strange ( or Strang) had a reputation as a survivor. 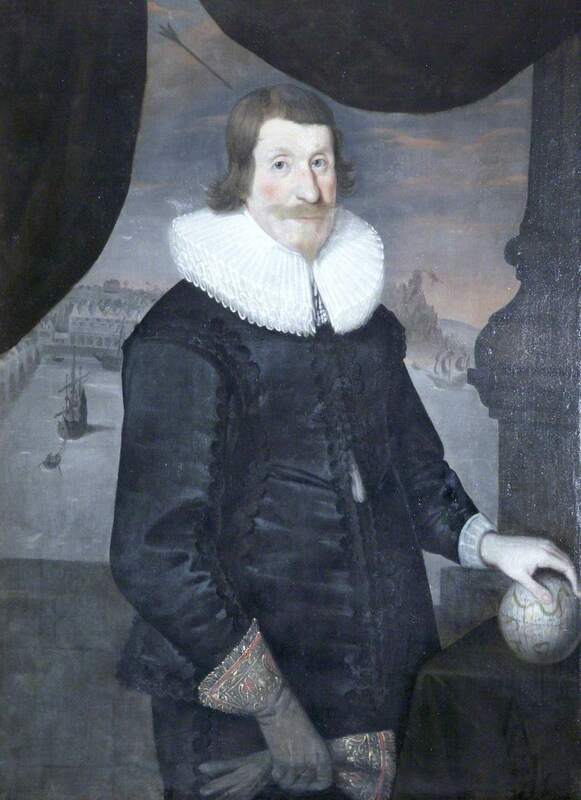 John rose to the position of town Mayor and his family later traded out of East-the-Water. When his portrait was painted in c. 1642, it portrayed all three incidents in its background. In the process it captured a 17th C. view of the Long Bridge and the town beyond, though it is far from certain which bank is shown (see Annex 2). Large quantities of wool from Spain were imported through the port during the reign of Charles I (1625-49), but 1646 marked the start of the the largest Spanish plague of the 17th C. The bubonic plague broke out in the city of Seville, and, with quarantine non-existent or ineffective, this pestilence then spread northward, carried by coastal shipping. In the same year, bubonic plague, said to have arrived with a consignment of wool from Spain, also hit Bideford. At least 299 townsfolk died, but the town was perhaps better able to contain the outbreak than Seville, not least because of the actions of John Strange. When the elected mayor fled, John, at the cost of his own life, stayed to organise the quarantining of the town and ensure an administration for its beleaguered folk.